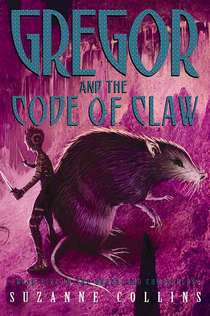 Gregor and the Code of Claw was written by Suzanne Collins. It is the final book of 5 in The Underland Chronicles. In this action-packed and suspenseful final installment in the acclaimed Underland Chronicles, Suzanne Collins unfolds the fate of the Underland and the great warrior, Gregor the Overlander. While the books were meant to be young adult or young reader books... I really throroughly enjoyed this series. The characters were deep and fully fleshed out. They felt real (and that's saying something when the majority of characters are larger than humans and are rats, cockroaches and bats). A series that can make me teary-eyed over the death of a cockroach or upset over how rats are treated contains some pretty amazing writing. I'm left really wishing that Suzanne Collins would take another visit to The Underland. I'd definitely join her!